Paige VanZant, the mixed martial arts (MMA) strawweight fighter, is also now a dancing heavyweight. The 115 pound VanZant is a contestant on the ABC reality television show ‘Dancing with the Stars’ (DWTS). In the competition that aired on May 2, 2016, she scored an impressive triple-10, which was a perfect score. She has been teamed up with professional dancer Mark Ballas for Season 22. As a team, the competing pairs vie against each other for best dancing over the course of the season. The pairs choreograph all of their own moves. In the episode highlighting her dancing prowess, VanZant and Ballas danced the jive. A completive Ballroom Jive incorporates elements of the Lindy Hop and Jitterbug. Essentially danced on the balls of the feet, it is a very lively production. The DWTS judging is done by Len Goodman, Carrie Ann Inaba, and Bruno Tonioli. The judges are accomplished professionals in choreography and competitive Ballroom dance. VanZant’s record in the sport of MMA will not be changing any time soon. Currently, it stands at 6-2 for the 22-year-old fighter and dancer. She has just canceled plans to be a part of the UFC 200 event this summer. This bout is scheduled for Las Vegas on July 9, 2016. DWTS success has forestalled her entry into the Ultimate Fighting Championship’s (UFC) event. VanZant’s dancing heavyweight status is hindering her MMA strawweight advancement. According to her manager, Mike Roberts, the time commitment to the reality show leaves little time for training in the sport which gave her the entrée into the reality show. Roberts was quoted as saying that the fighter is looking for “time to improve and get better, so we decided to postpone her return to about late-August.” The DWTS was to segue for VanZant into the UFC event. Both were using her popularity and success on the show as a boost to the UFC 200 match. The liveliness of the dance is considered tame compared with the full impact of mixed martial arts. At 115 pounds, VanZant is a strawweight, which places her in a weight division of 106-115 pounds. This is on the low end of the weight classes. It is sandwiched by the atom weight and the flyweight divisions. In the UFC, the strawweight is the lowest weight class always for assignment. The current UFC women’s strawweight reigning champion is Joanna Jędrzejczyk. She has defended her title twice since earning the top spot in March 2015. MMA has been a sport generally dominated by men. In 2013, a bantamweight division for female competitors was added by the UFC. The weigh-in weight for this class is over 125 pounds to a top weight of 135 pounds. Ronda Rousey was the winner of the first fight in this weight class, maintaining her title until November 2015. ESPN reported that Rousey beat out Floyd Mayweather in winning an ESPY for Best Fighter. VanZant, she is currently ranked no. 7 in the UFC’s women’s group. Going by the nickname “12 Gauge,” she is rated by the UFC as a well-rounded fighter with an arm reach of 65 inches. She couples this with a leg reach approaching 37 inches. The fighter stands 5-foot-4 inches. MMA is a combination of grappling, as in wrestling, and striking, as in boxing. Her striking average is about 50 percent while her grappling takedowns are at 40 percent. 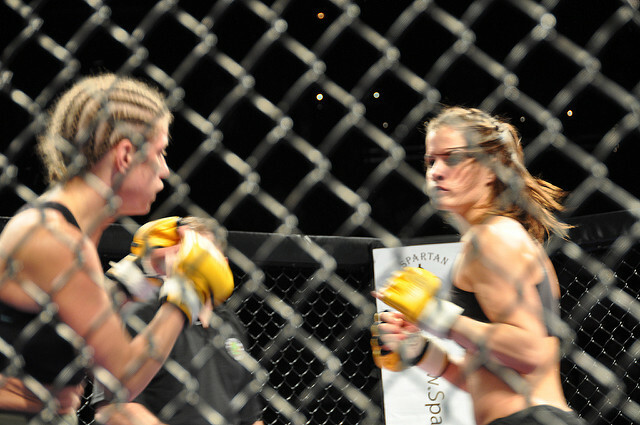 Before fighting for the UFC, she was part of the Invicta Fighting Championships combatants. Now, however, it seems that the MMA strawweight Paige VanZandt has been temporarily sidelined by the heavyweight dance of the stars.